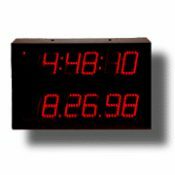 MP18C SUPER BRIGHT Digital Calendar Clock: 6 digit, red LED display with selectable 12/24 hour format, automatic seasonal correction and full 10 year battery reserve. 12 hour display features PM indicator lamp. Concealed set buttons prevent tampering. Surface mount with cord or hard wire mount on standard 4″ junction boxes.